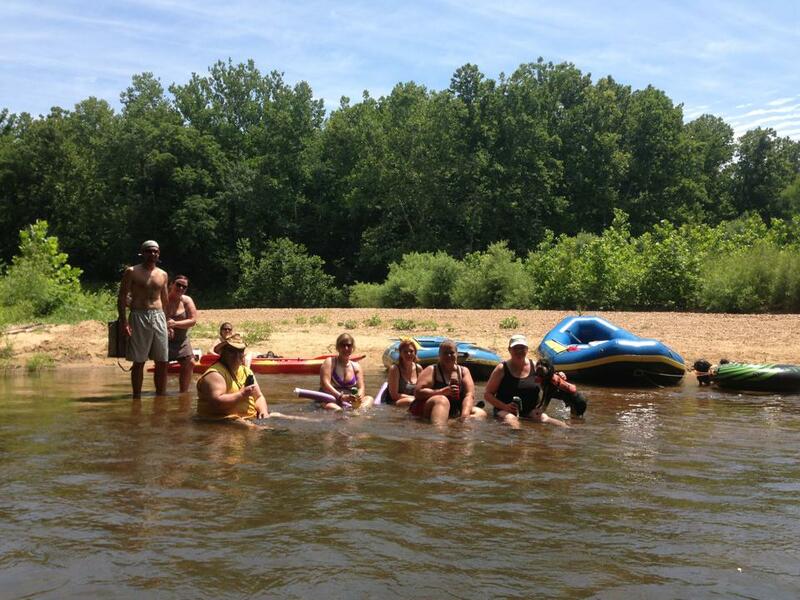 Every summer, I try to go on at least one float trip. I adopted my dog Milo last December, so this was his first time joining me on the river. The first float of the summer was rained out. We were planning on kayaking on Friday and rafting on Saturday, but the river was so high from recent rain that parts of the campground flooded and all boating was cancelled. We did hang around the campground all Friday, and Milo absolutely loved it. While the campgrounds official policy is that dogs need to be on a leash, there weren’t a lot of people there and I decided to give him a little freedom. He spent the day exploring around our cabin…and was having such a great time. I wasn’t sure how Milo was going to do with the river. He doesn’t like the rain and walks around puddles. So when I strapped on his new life jacket for the first time and walked him down to the water, I had no idea what he would do. He didn’t really like it, and was ready to head to the gravel shore as soon as I let him. I was shocked when later that evening he wandered into some water on his own. Later in the summer, we tried again. We planned another weekend trip, really hoping that the rain would stay away this time. And it did. 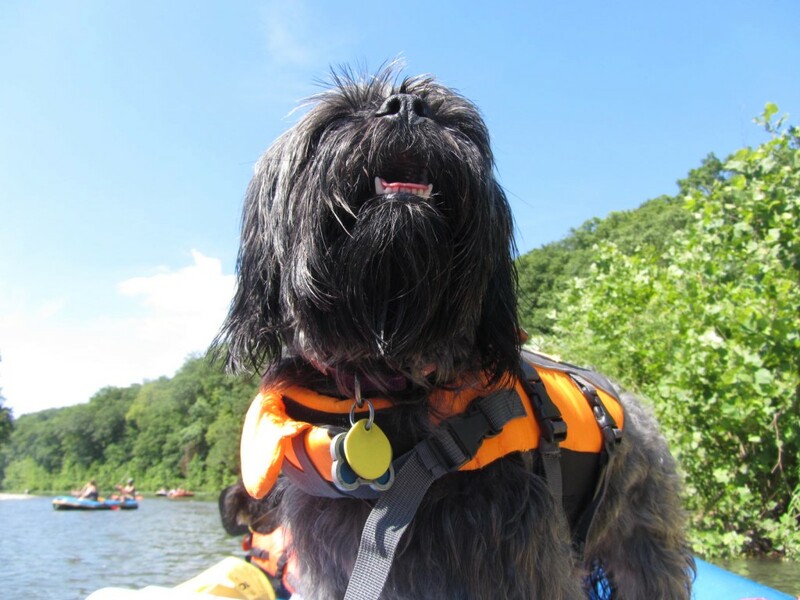 On Friday, Milo, me and my friend Sandy drove down early to the campground so we could enjoy a peaceful day on the river in kayaks. Milo wasn’t so crazy about the kayak. He really wanted to sit on my lap, but it’s hard to paddle with a dog on your lap, so I encouraged him to sit by my feet. He couldn’t get comfortable, so he stood up at the front of the boat off and on. He was standing between my feet after we had been floating a few hours when I hit some swift water. The current pulled me towards the bank since I didn’t feel I could paddle forcefully with Milo standing at the front of the boat. I had to push off of a low branch as I approached the river bank, and Milo lost his balance and fell out of the boat. Of course, him falling out of the boat also meant I fell out of the boat and it flipped over. 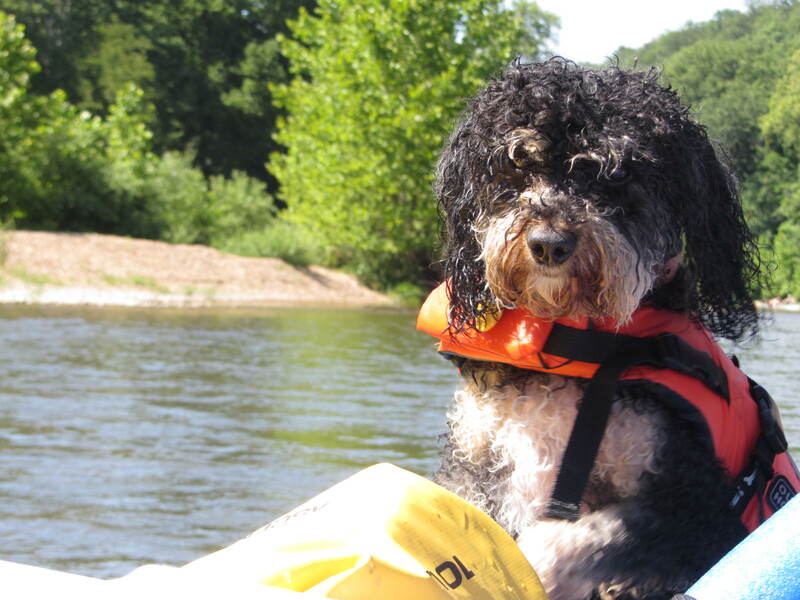 Luckily, Milo was wearing a life jacket so he was safe, and kayaks are easy to flip back over. It really was quite funny. 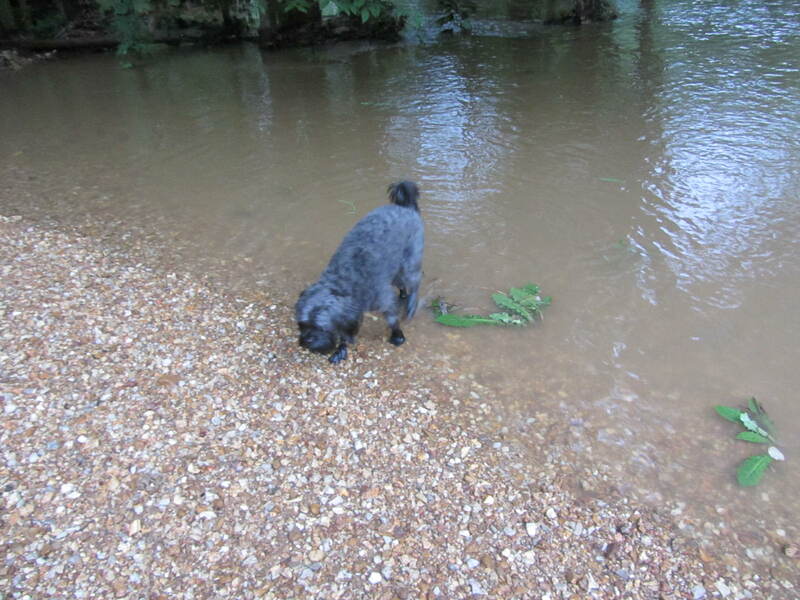 I was standing in waist deep water, trying to calm Milo down and hang onto everything. I dropped my paddle to help him get to shore while I hung onto the boat. Sandy headed downstream to catch my paddle while I got the boat to shore. By this point, Milo was safely on the land but there was some fairly deep fast moving water between Milo and me. By the time I finally got the boat pulled up on the rocks, Milo had a plan. You see, he decided he didn’t really like this thing called boating. He was ready to go home. And home was the direction we had come from. 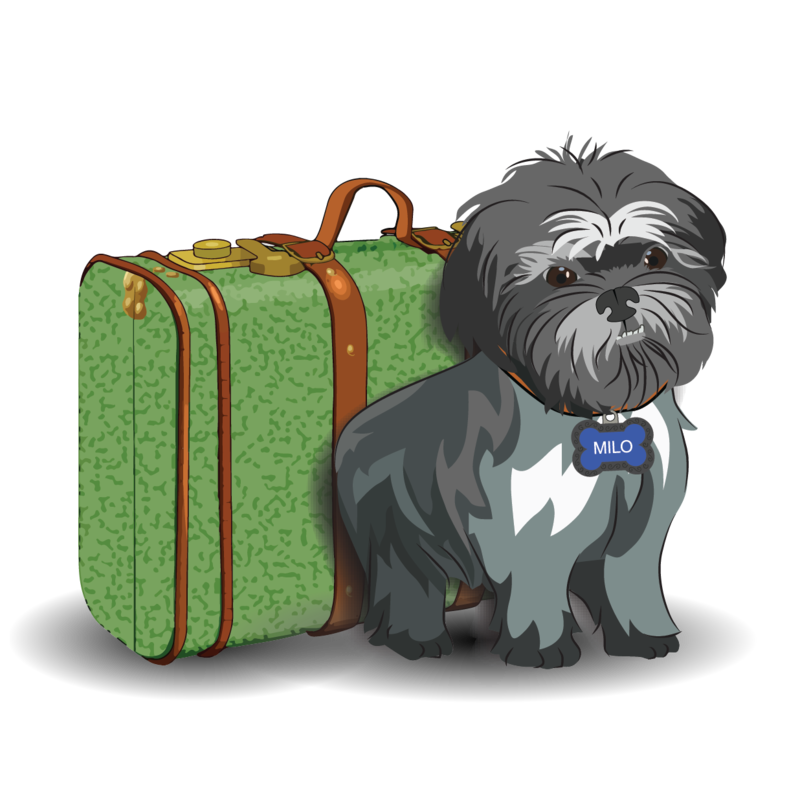 So Milo decides to start running upstream. I’m calling him at the top of my lungs and he is totally ignoring me. Every minute or so, he stops and looks back to make sure I’m still following him, and then he keeps going. After about 15 minutes, I somehow caught up with him and got him to come when I called. I carried him back to the boat. Without a paddle, there was no way I could carry him and drag the boat downstream in hopes of eventually catching up with Sandy. I really hoped Sandy had managed to catch my paddle. I had no choice. 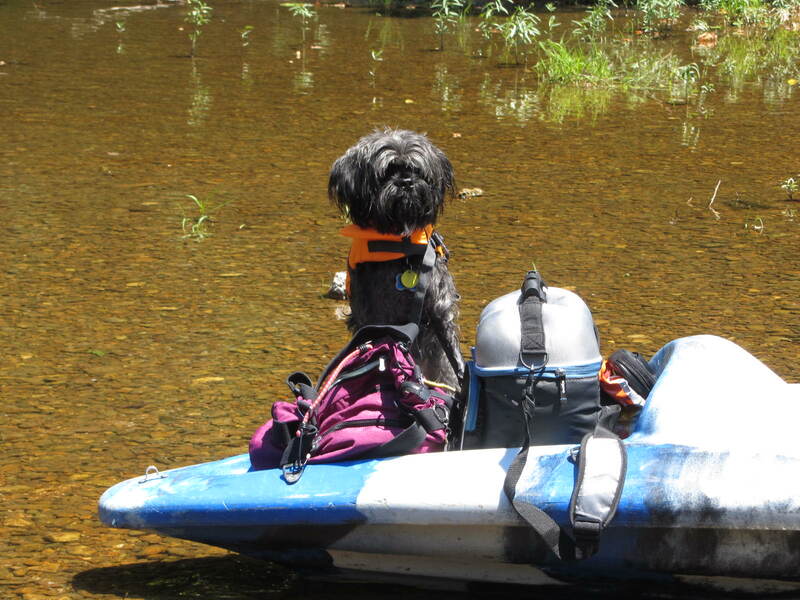 I sat Milo in the boat by himself and walked the boat downstream until we met up with Sandy and my paddle. The rest of the day was much more uneventful. Milo insisted on sitting on my lap in the boat…and because we flipped over when he was standing at the front, I agreed with him that it was the smartest place for him to sit. 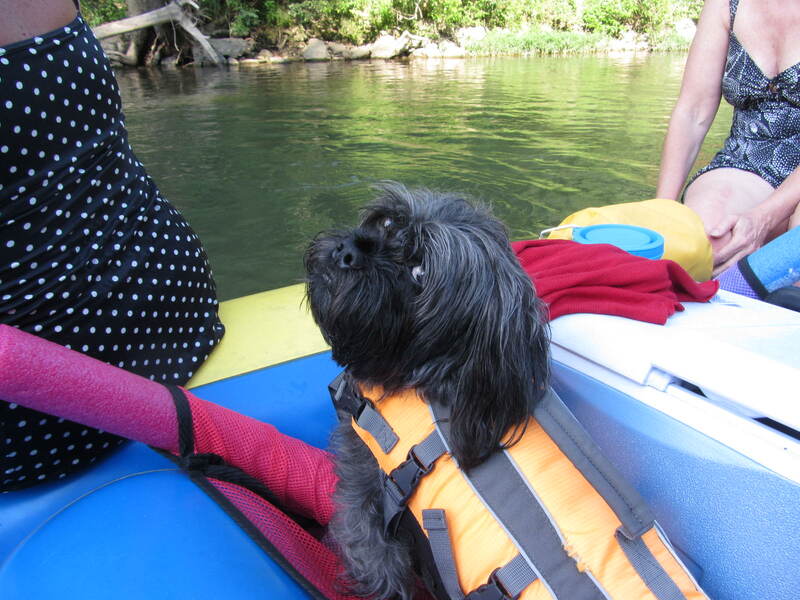 Milo liked rafting a lot more than kayaking. 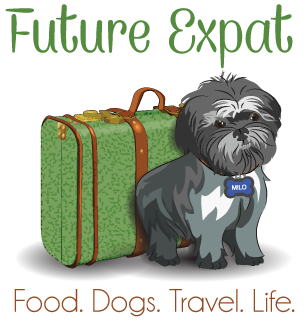 This time, we didn’t flip over and Milo didn’t try to run home. Milo even found a spot to take a nap in the afternoon, laying on top of our dry bag . He happily played in the water when we took a break at a sandbar, and even did a little swimming since it was the only way he could get to the string cheese I was holding in my hands. Milo even made a new friend. 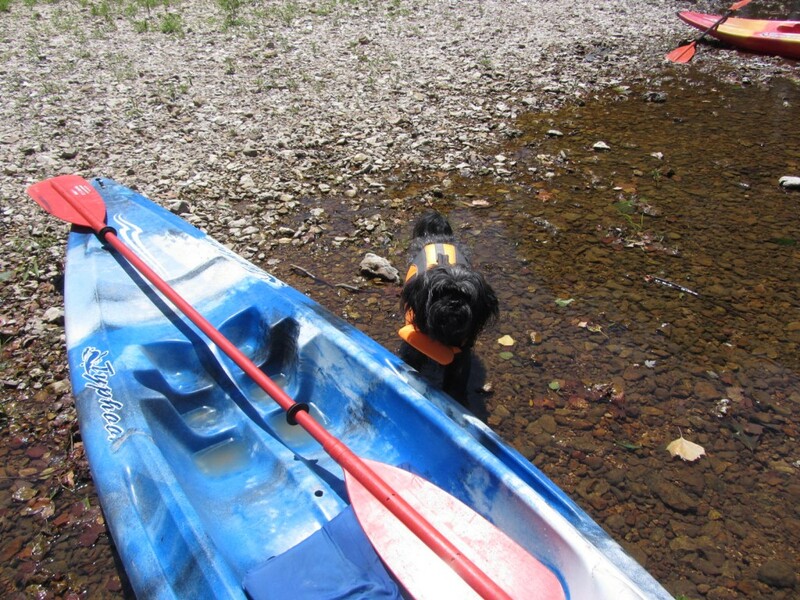 While Milo clearly did not like the kayak, your dog might be fine with it. Toby was. 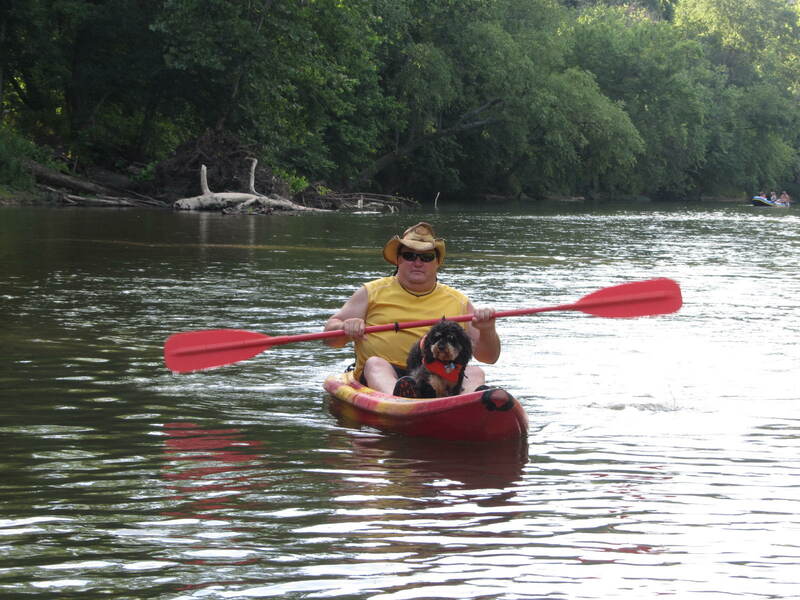 Towards the end of our float, Rick traded his raft spot with another friend so he could try out her kayak. Toby, a total daddy’s boy, was in despair seeing Rick in another boat. 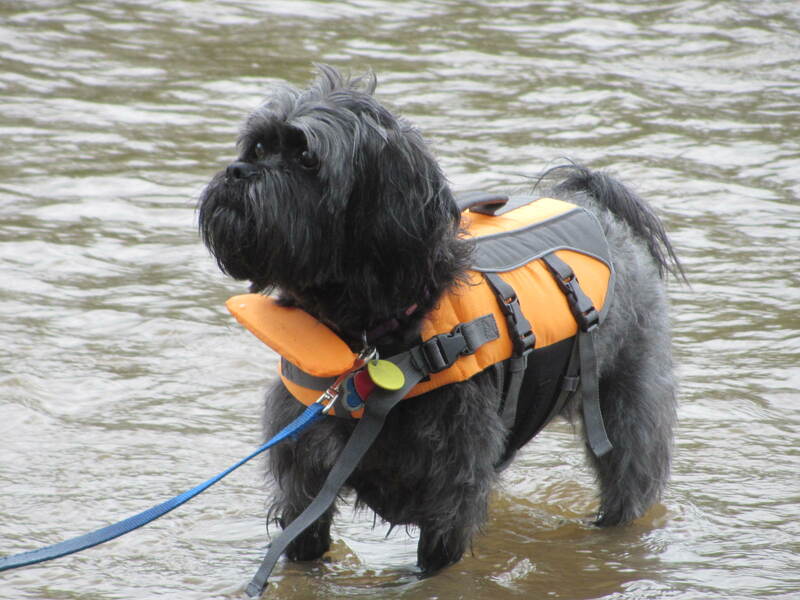 After whining for a while, Toby saw his chance, jumped into the water and swam to the kayak. 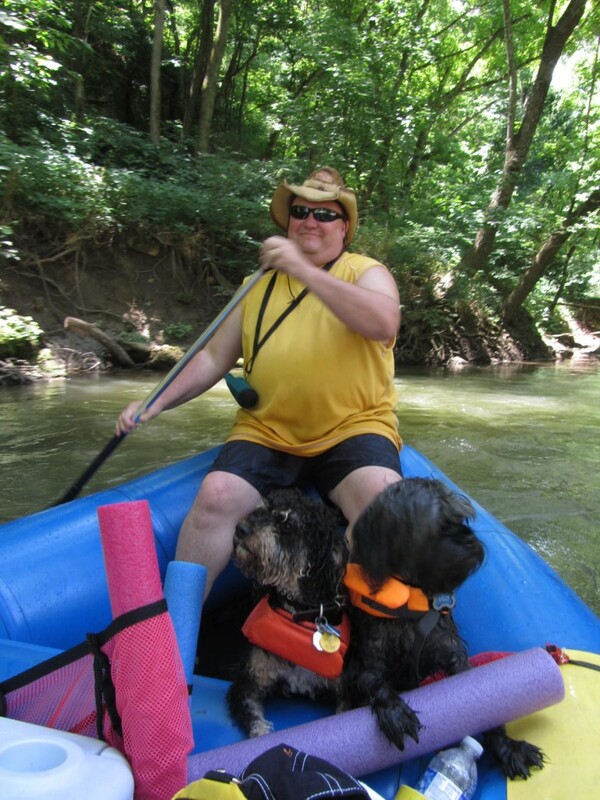 Rick and Toby finished out the float together in the kayak…without taking any spills. Have you ever taken your dog on a float trip? 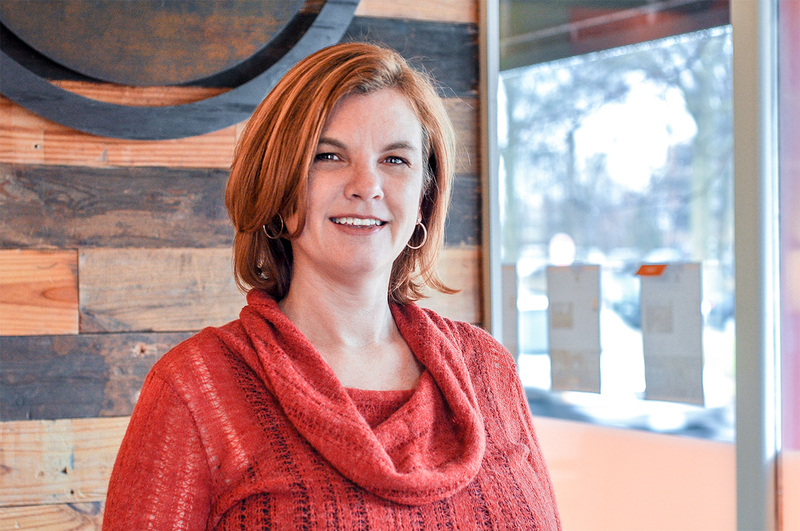 Disclosure: This blog post contains advertising. If you click the links for the the life jacket or dry bag and decide to buy something, I will get paid a tiny amount of money which will help me get closer to my dreams.